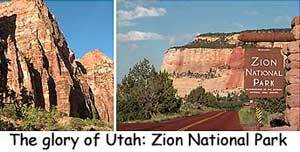 Whatever mortal first laid eyes on Zion must have been struck dumb. Even if you've seen pictures, nothing can prepare you for its awesome splendor. It's no wonder visitors in the 1860s gave the majestic sculptures they found here names from the Bible. 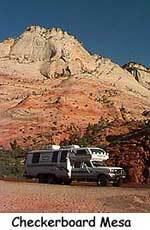 Zion is a natural cathedral, grander and more exquisite than anything a human could devise. Last year nearly 2.5 million people arrived to gaze at Zion's monumental spires. We knew that summer traffic jams are the norm in the canyon, and we set out early. The sun was just coming up as we arrived at the entrance gate. Our plan was to drive through the park and exit through the Zion-Mt. Carmel tunnel on the east side, a marvelous structure with picture windows every fifty feet. Since the Phoenix is too wide and too tall to navigate the tunnel in the face of oncoming traffic, we had to have a special permit to drive through alone. Rangers are stationed at each end of the tunnel to block traffic while oversized vehicles are inside. We were the first truck through that morning, which meant that nobody had to wait for us. Even though we'd arrived early, we were hardly alone. We met travelers from around the continent and the world who had also come to see the sun rise. No one wants to talk much, though. There's too much to look at, and the clear, cool air smells like cedar. We stopped several times to look and smell and look some more. At Checkerboard Mesa, an enormous crow came begging. Sleek and fearless, he obviously knows his way around tourists. The majesty of Zion ends abruptly. Suddenly we were back in plain Utah again, so we turned on the radio and headed for Cedar City. We felt like we'd been on holy ground.